Tonight I’m going to Science Fiction night at the Blind Poet to hear readings by Jane Yolen and Ken MacLeod. 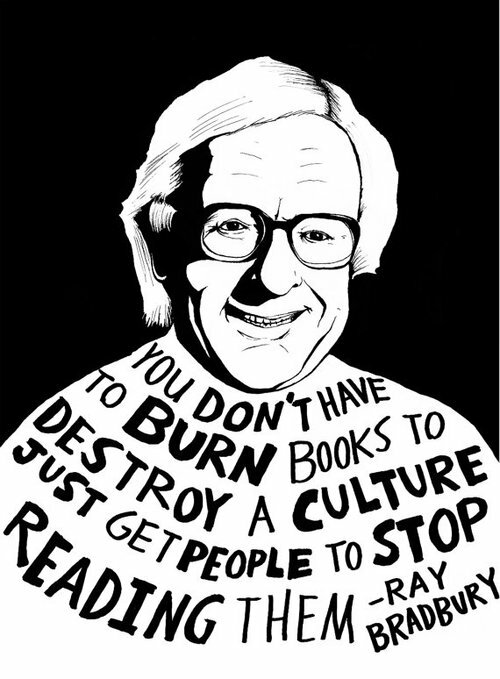 It’s an early celebration of Ray Bradbury Day (which is on the 22nd, the great man’s birthday) and he’s one of my all time favourite authors. When I was growing up, my much older brother had a bookcase filled with – among other things – science fiction. I wasn’t supposed to touch his stuff, but when he was safely out of the way, I would sneak Asimov and Bradbury books into my bedroom and lose myself in them. No one could take the everyday and spin it to a completely new viewpoint like Bradbury. I go back to his short stories again and again, and also to novels like The October Country and Death is a Lonely Business. If you haven’t read any – why on earth not??? – you’ve been missing a treat. And isn’t that a great quote? I’ve never understood why science fiction is underrated as literature – happy early birthday Ray! I know… Weird, isn’t it? Unless of course someone who’s a ‘literary’ writer has a go, then suddenly it’s OK!